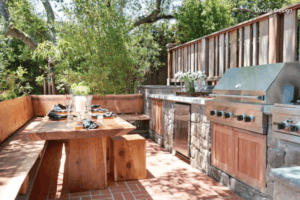 If you enjoy entertaining, you have probably dreamed of having an outdoor kitchen. Not only are they great for entertaining guests but they increase the value of your home, expand your living space, and keep any overbearing smells outside. With summer coming to an end, autumn has the best weather for outside entertainment. Not to mention, it can extend the life and use of your backyard patio. When it comes to an outdoor kitchen, you are typically looking for only the essentials: a grill, sink, and mini fridge. You will likely be doing the bulk of your prep work inside so there is no need for excessive space or energy wasting appliances. A smaller space allows the cooks to be a part of the party as well. Over time, porous stone tends to absorb the elements of an outdoor kitchen and loose its luster. 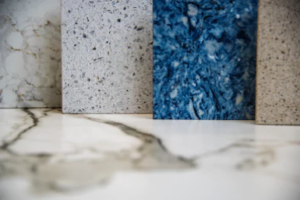 Granite and soapstone are agreed upon as the best outdoor countertop materials. They don’t stain, or fade in the sun. We recommend steering towards a lighter stone due to the surface heat that occurs with dark stone in direct sunlight. 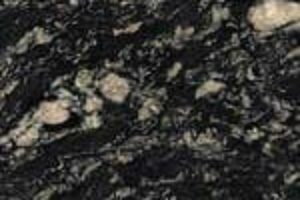 Thankfully, we have an abundance of granite and soapstone at our location. If you are in the process of fully remodeling your home or building new, consider a satellite kitchen that is just as much inside as it can be outside. Using some large doors and an open concept, any indoor kitchen can become an outdoor entertainment area. With the football season opener under our belts you may want to think about having an outdoor bar, or even a tap with your friends favorite local lager. Even though it is an extra addition, it sets you apart from other homes. If you are looking to design a backyard kitchen or would like to chat about your options, contact us.